The department of Information Technology is organizing a workshop “Tips and Tricks in Adobe Photoshop and Illustrator” by Mr. Zaid Al-Hilali , Adobe Training-ME on May 20th 2012 from 10 AM – 12 Noon. The department is arranging 50 seats for students & faculty interested from other departments. Further Grapheast, Authorized Distributer for Adobe products is offering 80% discount on ADOBE CS6 products for students and faculty attending this seminar. 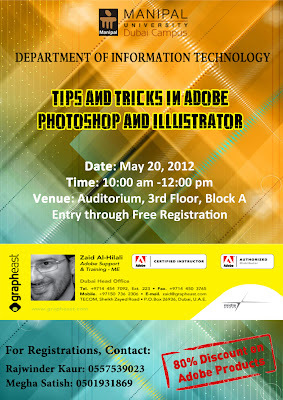 For more details on the workshop and the Adobe offer please see the attached poster. For more Information and registration students and faculty can contact Prof. Zaheeruddin Ahmed (zaheeruddin@manipaldubai.com).